By the end of May, most of the water had gone. 3:33pm, Tuesday 25th May 2010. 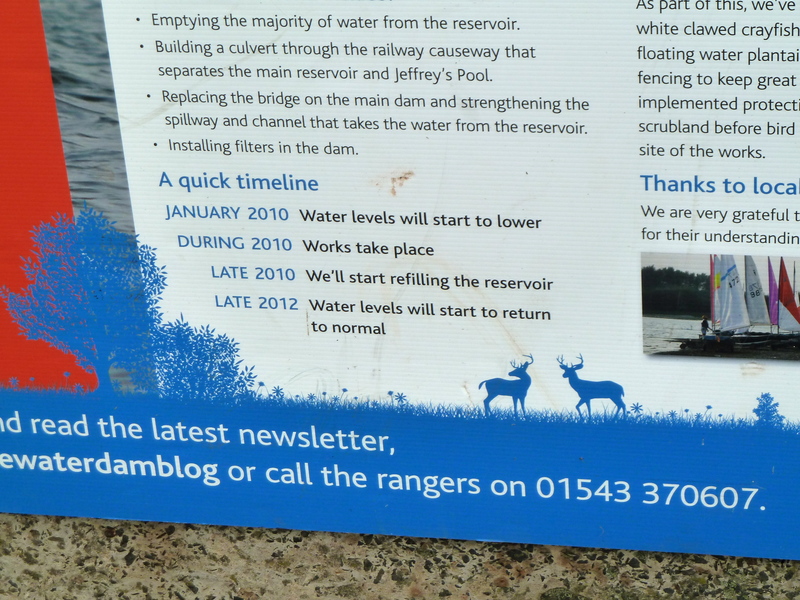 A number of sites have now announced that work is due to start on the dam at the beginning of October. The story broke first on The Chasewater Wildlife Goup’s site, closely followed by The Lichfield Blog and then, finally, Lichfield District Council’s Chasewater Dam Blog. This is a bit of a surprise to many, as previous publicity stated that the work would be started in spring and be complete by the end of 2010. Over the summer, it’s been awfully quiet on the subject of Chasewater. The official blog updates slowed to a crawl, and after the election, attention-seeking MP Michael Fabricant forgot the whole issue, preferring his usual cheap stunts like making childish mockery of the French. Clearly choosing not to hassle his beloved leader over the issue of funding for the project, it seems that the MP was happy to attack from the opposition benches, yet lacks the guts to do the same to his own government. It’s sad that the member who caused such ill-considered furore didn’t seem to have the balls to continue the fight once he was safely re-elected. Even the fisherman, formerly so aggressively vocal, fell silent once the huge bounty of fish in the lake turned out to be largely virtual, yet another fisherman’s tale. I’ve since heard that they’re planning to restock the lake themselves after the work is complete, providing they win the lottery. Three numbers should cover it. Once the draining of Chasewater was nearing stabilisation, Lichfield District Council dropped the bombshell that they hadn’t yet sought tenders or appointed a contractor for the work. Simultaneously, there was some buzz in the media that the cash-strapped authority was attempting to pass the whole park – and responsibility for the works – onto Staffordshire instead. One can’t help but feel the two to be connected; it now looks like the attempt to sidestep the whole situation has failed and the works will now start much later than expected. Signage in the park still misleadingly suggests the work will be completed in late 2010, but it has yet to start and if it does, it will progress through the winter. If there’s bad weather, this could delay work even further, and will mean at least two summers without water. The water sports people are understandably fuming, as they are expected to continue paying subs to landlocked clubs with no facilities. The situation must also be worrying for British Waterways, who face even longer without one of their main feeder points supplying water to the canal network. In their defence, the council published a sadly terse and intemperate response, in which they bluntly point out that it’s their party, and if we don’t like it we can clear off. I find this sad and not a little regressive, as the dam blog had formerly been a wealth of information and discussion. I would previously have held the blog up as an excellent example of how councils can interact with the public through new media – both Lizzie and Stuart have been doing an excellent job. The site did much to placate and inform the naturally worried users of the park, which now faces major works during the wettest seasons – work which is unlikely to pass off without hitches. Lichfield prevaricated, almost abandoned blog updates and consequently look to have been sadly ill-prepared for the appointment of contractors, and are now losing the trust and goodwill of those of us who love and care for this hugely sensitive country park. One would hope that the goodwill can be restored, and was not just a symptom of the then oncoming election. This entry was posted in Brownhills stuff, Chasewater, cycling, Environment, Followups, Interesting photos, It makes me mad!, Just plain daft, Local media, Local politics, planning, Shared media, Spotted whilst browsing the web, Wildlife and tagged Brownhills, Canal, Chasewater, Chasewater Dam, Chasewater fish, Chasewater Wildlife Group, Cheap tat, Cycle rides, Dam, Dam works, fish rescue, Galliford Try, Lizzie Thatcher, local blogs, Local politics, Michael Fabricant, New Photos, planning, Politics, Reservoir, Silly, Staffordshire, Strange Notices, Wildlife. Bookmark the permalink. So they’ve ‘considered’ requests for rent reduction. Have they actually reduced rents, or is considering thought to be good enough?